With EastComfort Romania, there is an apartment for everyone. 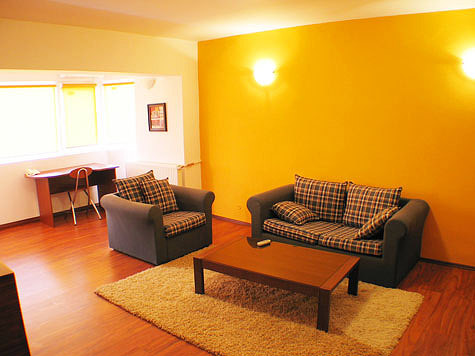 Here are displayed more than 50 quality Apartments for your accomodation in Bucharest, near the commercial areas. The apartment is located near the Parliament Palace providing accomodation in front of the Marriott Hotel. In this apartment, the restored antique wood furniture from the living and bedroom is combined with the modern, elegant kitchen and bathroom, creating an elegant and comfortable place which ensures the right Bucharest accomodation. In the living room there is a coach, armchairs and a desk to fit your business needs. In the large kitchen you will find the utensils necessary to cook (gas cooker, refrigerator, microwave oven) while in the bathroom the jacuzzi can help you relax after a busy day. The surroundings consists in a wide variety of remarkable entertainment places (bars, clubs, discos, hotels, fast-foods) or commercial / financial points of interest in Bucharest (stores, supermarkets, banks, firm quarters).